Of all the ridiculous notion floating around in the liberal media is the notion that higher minimum wages will create jobs. The theory goes like this: Pay people more, they will have more to spend, and by spending more they will create more jobs. On that basis, proponents argue for a $15 minimum wage at McDonald's. There are several obvious flaws in such arguments. No one in government has any idea where to set a minimum wage to achieve such miraculous results. Should the wage be $9.78, $12.22, or $14.88? Logically, wages vary by industry, skills needed, and actual skills of the workers. A government mandated minimum wage says none of those matter. No matter what you do, or how badly you perform that task, you get a guaranteed rate. Many small business owners, the very kind that the liberal media blames the likes of Walmart and McDonald's for destroying, will not be competitive at forced higher rates. Businesses will do everything possible to not raise salaries until it affects their bottom line. In regards to point number four, Walmart announced a wage hike because turnover was too excessive. It did so, not because of government mandated minimum wage, but rather because of turnover and the quality of employees it could attract at the wages it was offering. If that does not convince you, please consider Union Group Mobilizes "Against" Pay Hike. Also in regards to point number four, and something I have noted before, Restaurant Ordering Robots to Replace Human Jobs. Panera is ready to launch the restaurants of its future. Using online restaurant ordering, you will either place your own order on your smartphone or on a tablet device at the restaurant. And then the kitchen staff will just show up with your order after you pay on your phone or on the kiosk. This method frees up labor to work on food prep and serving. It enhances order accuracy and gives you better service. But will you miss the human touch of a waiter or waitress? Having done this kind of ordering outside the U.S., I can honestly say you won't miss it at all. There's also another reason why you'll see online restaurant ordering take off in the near future. In areas where they plan to boost the minimum wage, there's a good chance that will equate to labor cutbacks. So the person taking your order will be replaced by a machine! Tablets are also coming to the table at your local Chili's to take your order, to offer pay games to entertain your kids...and to upsell you on dessert! Chili's will install table-top tablets in its more than 1,200 stores by next year, according to The Wall Street Journal. Applebee's has also been testing such tablets, but no word yet on a full rollout from them. Some restaurant chains will look at this technology and see a way to reduce staff headcount. But the really smart ones will use it as a way to get their servers focused on super-serving you at the table -- since some other parts of the job that used to be done by people are now going to be automated. The idea that higher minimum wages create jobs is absurd. And let's look at this from one more perspective: demographics. As boomers head into retirement, forced or not, an increasing number of people are dependent on Social Security. 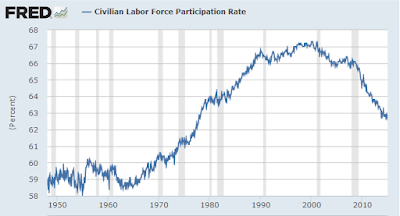 The participation rate shows just that. Precisely what do you think retirees on fixed income think about 0% interest rates and the price of food, especially at places like McDonald's that are already struggling? It is ridiculous to think that raising the minimum wage to $15 for uneducated, low-skill workers will be enough to counteract the number of people who decide "I cannot afford to eat out anymore, especially since it's unhealthy garbage anyway." There will be no increase in jobs as a result of a hike in minimum wages. 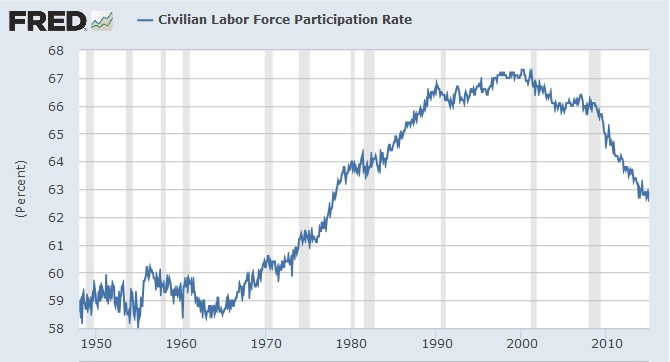 Any historical attributions otherwise were a result of the increasing participation rate or other economic situations creating an increasing demand for workers in the face of wage hikes. A hike in minimum wages only benefits marginal employees who retain their jobs. Everyone else loses by paying more for goods and services. Businesses will be forced to pass on costs. No one can possibly benefit from such a spiral. Studies that show jobs rose after hikes in minimum wage, really show jobs rose in spite of minimum wage hikes!